I’ve never been one to run straight to the medicine cabinet when I get sick, but I’m not opposed to the appropriate use of modern medicine. I feel that taking care of myself with simple natural ingredients is one way I can stay connected with the natural world, especially when I can grow and harvest some of the ingredients myself. What a bonus then, that many natural remedies can be made without waste. Here are 14 natural, zero waste remedies that I use to alleviate cold and flu symptoms. 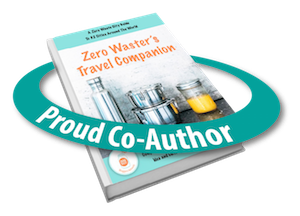 Because I don’t want to make my life harder than it needs to be, and I want to make zero waste living as accessible as possible, all the ingredients used in these remedies are easy to find no matter where you live. Peppermint tea – has decongesting properties. Make it at home or find somewhere to buy loose tea leaves. Otherwise, make sure the teabags and packaging are not made from plastic so that it can all go in the compost when you’re done. Eucalyptus essential oil – has antimicrobial properties, loosens chest and sinus congestion, and relaxes muscle aches. Essential oil refills are hard to come by, so I buy a few essential oils that have a multitude of uses in large glass bottles. I avoid plastic packaging. Tea tree essential oil – has antiviral and antibacterial properties. Lavender essential oil – has anti-inflammatory and cooling properties. Good for stress and headaches. Epsom salts – are rich in magnesium and are a natural muscle relaxant. Can be bought in bulk or in a plastic free cardboard box which can be reused or recycled. Sea salt – has mild antiseptic properties and is a mild astringent. Buy it in bulk. Sage – has astringent compounds that temporarily relieve pain. It also has antibacterial and antiseptic properties. Grow sage in your garden or purchase loose leaves either fresh or died. You can dry it yourself if needed. Ginger – is good for respiratory congestion and is a proven anti-nausea. If you are unable to grow ginger root, buy organic ginger from your local farmer or grocer. Candied ginger can be made at home, otherwise buy it package free from your bulk or health food store. Honey – is antibacterial. Buy it in refillable tubs or in large glass jars with metal lids. Do not give honey to children under one year of age. Lemon – is an anti-inflammatory. High levels of citric acid helps fight off bacteria and viruses. Onion – Onions are expectorants (they loosen mucus that cause coughs), antimicrobial, and have anti-inflammatory properties. The steam and heat from hot drinks helps thin mucus, making it easier to remove and relieve congestion. Hot fluids also heat the throat and slow the lifecycle of the virus. Peppermint tea is said to have decongesting properties. Soak a washcloth in a small bowl of hot water with three drops of eucalyptus oil. Place the washcloth over your sinuses and repeat when the washcloth cools. Pour boiling water into a heatproof bowl, add a few drops of eucalyptus and tea tree essential oils. Place head over the bowl and breath in the steam for ten minutes. Placing a towel over your head and the bowl will help. Collect eucalyptus leaves and hang them in the shower behind the shower head. The steam from the shower will release eucalyptus oil into the air providing a relaxing experience that will aid decongestion. The increased blood flow caused by spicy foods loosens mucus, helping to expel it from the sinuses. This never fails for me. Soak in a bath of Epsom salts with 10 drops of eucalyptus oil. You could also try ginger essential oil for a warming effect. Add three drops of lavender essential oil to a bowl of lukewarm water. Soak a washcloth, wipe forehead and back of the neck. Dissolve a teaspoon of sea salt in 250ml of warm water, then gargle and spit out. I do this as soon as I start to get an irritated throat. If the feeling comes back in a day or two, I do it again until it stops. Pour 250ml of boiling water over two teaspoons dried sage. After 10 minutes steeping, strain, and add half a teaspoon of sea salt. Gargle several times a day. Massage a couple of drops of lavender essential oil onto your temples. Simmer one or two teaspoons of chopped fresh ginger root in one cup of water for ten minutes. Strain and sweeten if necessary. Add a squeeze of lemon to half a teaspoon of honey and let it dissolve slowly in your mouth before swallowing. If you have kids and they don’t like the taste, try adding cacao powder to give it a chocolatey taste. Do not give honey to children under one year of age. Finely chop an onion and cover with honey. Warm ingredients in a covered pot, on low heat for 40 minutes. Alternatively, do not heat but leave overnight. Store in a glass jar in the refrigerator and use fresh. Take one teaspoon three to eight times a day until the cough is relieved. Do you use any natural remedies? I’d love to hear about your favourites, especially those made from easy-to-get ingredients. This is great. I am going to add a link to my Natural Remedies post. I had a horrendous flu this spring, and though I attempted to use many remedies that I researched, I eventually grabbed for the ibuprofen, as my whole body was aching and I was miserably uncomfortable. Luckily I am not one of those people that runs to the emergency room to get antibiotics for a flu that will … simply not work! I love the idea of hanging the eucalyptus leaves on the base of the shower head, I’m definitely going to try that! I have tried a few of these remedies. It is good to be reminded that there are so many commonly used plants that can ease our winter woes. It’s not as strong as using a few drops of eucalyptus essential oil in the shower, but still a nice thing to do.